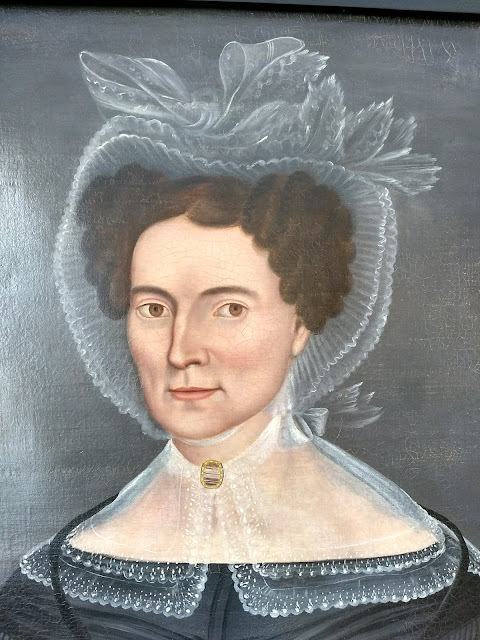 This portrait was initially purchased by the museum at Sotheby's in 1988 as "Clarissa Moody Wright in her wedding bonnet". Let's really dig into the clothing on view here, and then I'll talk some more about why this piece is of such interest to the SLCHA. 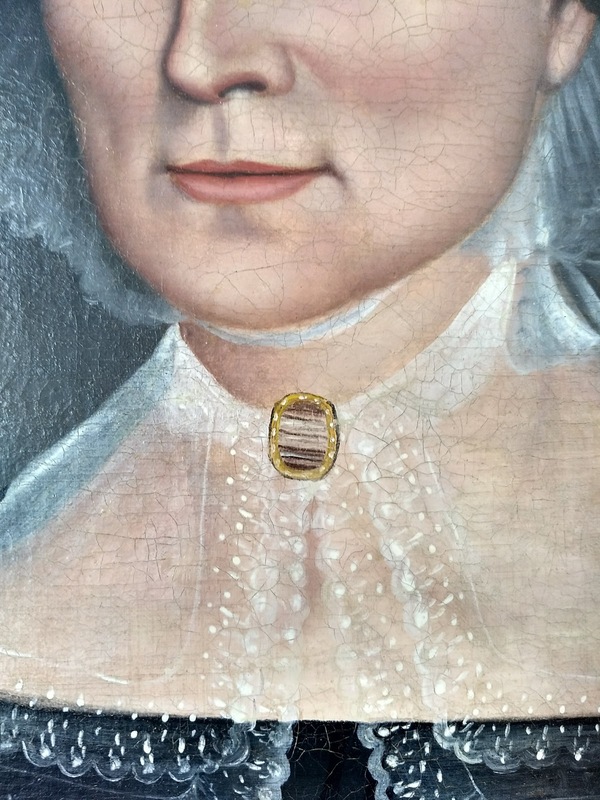 A dark-colored gown is very common on sitters in folk portraits, but it's not always so common to see this much detail! Quite often, the dress is a kind of dark mass that sets off the whitework on the cap and pelerine. Here, we can see that the bodice has what was known as a "Sévigné" drapery across the bust, or was made à la Sévigné - named after a seventeenth-century portrait of the Marquise de Sévigné. The neckline is quite open, which was common on day gowns of the early 1830s. Her sleeves are very full and gathered or narrowly pleated to the low armscye, then caught again an inch or so below it: a method for controlling fullness at the sleeve head that would become very common later in the decade. The gown's waistline is a bit raised, and covered with a matching belt. Small cap, with broad border of rich figured blonde, and trimmed with pink satin ribbon, cut into leaves, and strings of gauze ribbon. The sitter's front hair is parted down the middle and arranged in large bunches of curls on either side of the forehead - a style that was almost universal among fashionable women from about 1825. The rest of her hair is probably in what we would call a "bun", but was called a "knot" or occasionally "à la Grecque", in the Greek style, when it was referred to in fashion periodicals. As it was the most common way of dressing the back hair for everyday, non-evening styles, it really didn't require a label! Her bare neck and shoulders are covered with a transparent muslin pelerine, edged with two scalloped and embroidered ruffles. (You can see the very fine white lines representing the seams.) This has the advantage of both hiding the skin and creating the sloping-shoulder look that was becoming fashionable. It's held at the front with a brooch that is probably made for mourning - it's hard to tell because it's so small and therefore not clearly painted, but it looks like it might hold grey and brown hair, and have pearls on the gold setting. She is wearing a gold watch on a long black ribbon necklace, with its key; the watch is tucked into her belt. Watches worn as pendants like this, tucked into a belt or pinned to the bodice to take the watch's weight off the neck and keep it from hanging straight down, were a popular piece of jewelry for women who could afford them, and you'll see them in many (if not most) portraits of the early 1830s. They became much less common after this, probably because the lower and typically unbelted waistline left women with nowhere to tuck them. Now, why have I made a point of referring to "the sitter" and "she" rather than calling her "Clarissa"? 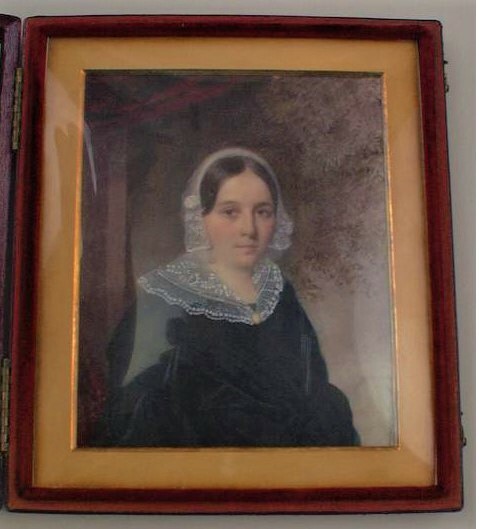 Clarissa Moody, born in 1804 (either just before or just after her parents and older brother, Simeon, settled in Canton, NY), first met Silas Wright when she was 14 and he was 23 - he had just moved to the area and started boarding with her family as he began his career as a lawyer. They married fifteen years later, on September 11, 1833. By this time, Silas had been elected to the New York State Senate, then the United States House of Representatives, and returned to be state comptroller in Albany - he would very soon go on to the senate and eventually be elected as New York's governor for one term; after being voted out in 1846 and finishing his term, he left public life and came back to Canton, where he died of a heart attack within the year. The SLCHA museum is located in the house they shared, where Clarissa lived on her own for twenty-three years after his death. 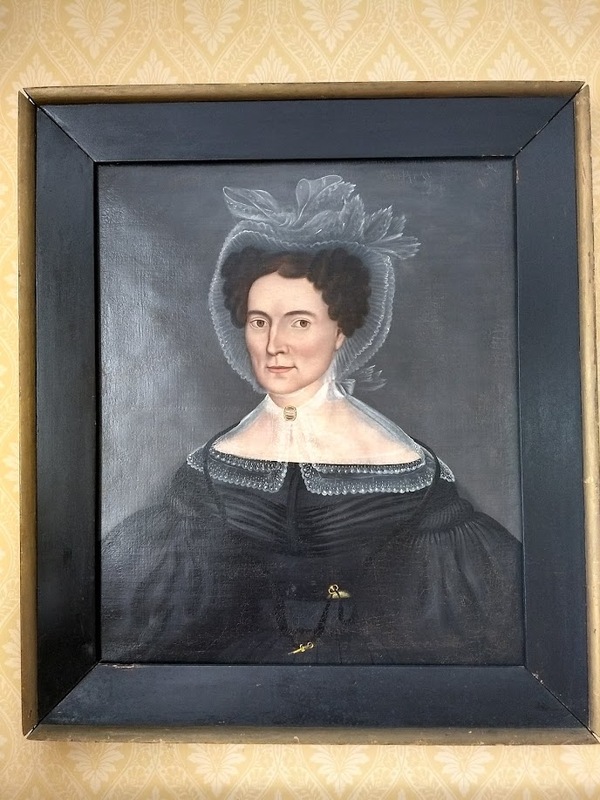 Some time ago, JeanMarie Martello, the archives manager at SLCHA, cracked the mystery: the portrait is most likely of Susan Brown Moody (1804-1847), Clarissa's sister-in-law through the aforementioned Simeon Moody. That nose and overall facial structure is a match to the one in a photograph of Susan Brown's brother, and the sitter being in the Moody family and the same age as Clarissa helps to explain how the misattribution came to happen. To me that brooch looks like a piece of agate in a gold frame. I've seen similar stones, usually comprised of carnelian and other kinds, not cut and glued but naturally formed in bands of different agates. The are usually called banded agate, of course. It could be bits of hair but aren't those generally made into shapes? 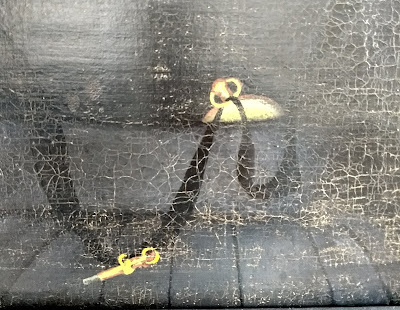 Hair in mourning brooches was typically woven/braided into a flat mat, as in these examples, so I thought it was a kind of abstract representation (given how small the brooch is painted). But banded agate looks a lot more likely. Thank you for the suggestion! I see what you mean in that heart locket example! I'm still going with banded agate, too, though.